United Airlines unveiled its state-of-the-art flight training centre in Denver, Colorado. The single-site training centre is the largest in the world and home to the company's more than 30 full flight simulators representing all of United's fleet types. The flight training centre is visited by United's more than 12,000 pilots at least once a year for new and recurrent training and is also the largest single-site training facility for other airline pilots. More than two dozen other airlines and government agencies send their personnel to train at the industry-leading facility. In addition to pilot training, the facility hosts flight attendants and maintenance technicians for emergency training and other activities. 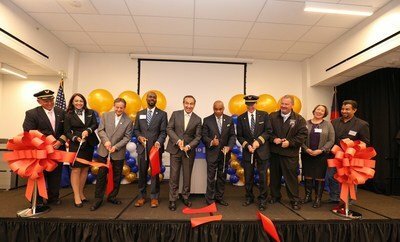 "This state-of-the-art flight training centre symbolizes the investments we're making in our people and our company, both in Denver and throughout our network," said Oscar Munoz, CEO of United Airlines. "In addition to providing industry-leading training for our pilots, flight attendants and other vital work groups, this facility will become a thriving centre where we foster the professional culture, commitment to safety and dedication to customer service that's at the heart of the United success story we are seeing take shape." United has been training pilots in Denver since 1943. The current campus first opened in 1968 with four buildings, expanded in 1992 with a fifth building and expanded again in 1997 with the addition of a sixth building. In 2015, the company made the decision to consolidate its flight training centres in Denver, kicking off the renovation and nearly doubling the number of flight simulators at the facility. United recently broke ground on a seventh building, which will bring the campus to nearly 540,000 square feet including eight more full flight simulator bays. United is Denver's largest airline offering more flights and more seats from the Mile High City to more destinations around the world than any other carrier. United operates more than 450 daily flights to over 150 airports worldwide from Denver. United will launch 12 new markets in Denver by the end of 2018 and is planning additional new markets for 2019. United has a storied history in Denver, serving the community for more than 80 years, and benefits from a great partnership with local leaders at the city and state levels, including Governor John Hickenlooper and Denver Mayor Michael B. Hancock, who understand the importance of a thriving aviation sector. The company has a commitment to giving back to the community where many of its customers and employees live and work. United supports local organizations like Girls Inc., Mile High Youth Corps, Wings Over the Rockies and the Denver Public Schools Foundation and, earlier this year, announced a $1 million grant to local Denver nonprofit Warren Village.